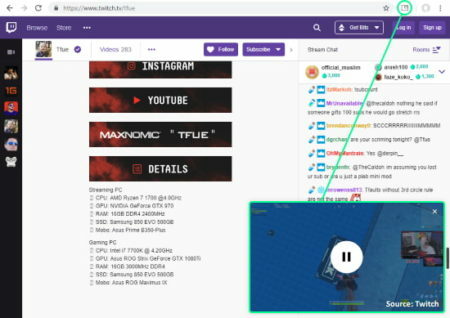 This article covers 5 free Chrome extensions to use picture-in-picture mode on Twitch and Vimeo. Picture-in-Picture mode opens the currently playing video in a floating window on the screen. This mode was initially exclusive to YouTube. But with these extensions, you can use it on Twitch, Vimeo, and other websites. Being a Chrome extension makes these extensions platform independent. You can install and use them on Google Chrome running on Windows, Linux, macOS, and ChromeOS. All these extensions sit in the menubar of the Chrome browser from where you can tap them to open the currently playing video from the active tab in a floating window. The floating window always stays at the top of the screen no matter what program you use. The floating picture-in-picture window is resizable and you can place it anywhere on the screen. You can click and drag it from one place to another. Also, you can close the floating window anytime by tapping the cross-icon present at the top right corner of the window. This lets you keep an eye on the video while doing other tasks on your computer. All these extensions are similar in terms of features and usability. Do note that, while you are free to do whatever you want as the video plays in the PIP mode, you must keep the original tab open. Picture-in-Picture Extension is a free extension for Google Chrome offered by GoogleChromeLabs. 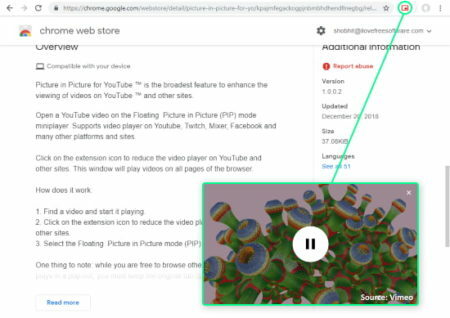 This is one of the best extension on the Chrome Web Store to get picture-in-picture mode on Vimeo, Twitch or any other website that uses an HTML5 player. With this extension installed, you can easily open the video from the active tab into an always-on-top floating window. To do so, all you have to do is click the extension icon from the menubar. If you are feeling too lazy to move your mouse cursor all the way up to the menubar, you can do the same with a keyboard shortcut as well. Simply press the Alt + P (⌥ + P on macOS) to open the currently playing video in a floating window from the active tab. Get this picture-in-picture extension from here. The next free extension to open Vimeo and Twitch video in a floating window is Picture-in-Picture. 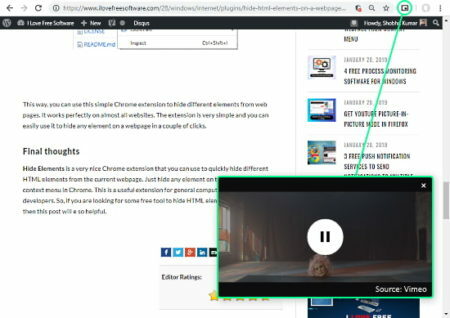 This extension uses the native picture-in-picture feature of Chrome to open the video in a draggable floating window. Just like the above-mentioned extension, you can place the floating window anywhere on the screen and resize it accordingly. This way, you can do other tasks simultaneously while watching the video. Add Picture-in-Picture mode to Google Chrome from here. PiPPY is another free Chrome extension to get the picture-in-picture mode on Twitch and Vimeo. 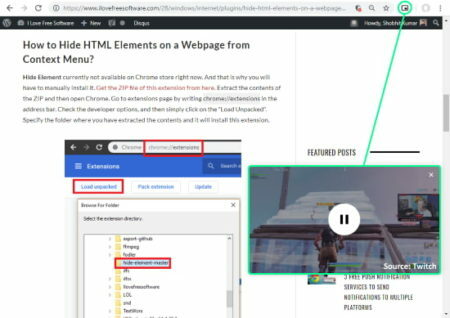 This extension enables Google Chrome’s native picture-in-picture mode on all the websites with the HTML5 player. This makes it work on YouTube, Mixer, Twitch, Facebook, Vimeo, and many other video platforms. The process to open the video in a floating window is same as other extensions. Get PiPPy from Chrome Web Store here. As the name suggests, Picture in Picture for YouTube & other is a free Chrome extension that enables picture-in-picture mode on YouTube and other websites which use an HTML5 player such as Twitch, Vimeo, DailyMotion, Netflix, Amazon Prime Videos, etc. Play a video in the supported website and click this extension from the menubar to open the video in a mini draggable floating window. Add this free picture-in-picture extension to Chrome from here. CIP – Picture In Picture Player is another free picture-in-picture mode extension for Google Chrome that supports many video platforms including Twitch, Vimeo, Netflix, BiliBili, etc. Similar to all the other extensions covered in this article, you can easily open a video in picture-in-picture mode by tapping the extension icon from the Chrome menubar. The mini player is draggable and says always at the top. 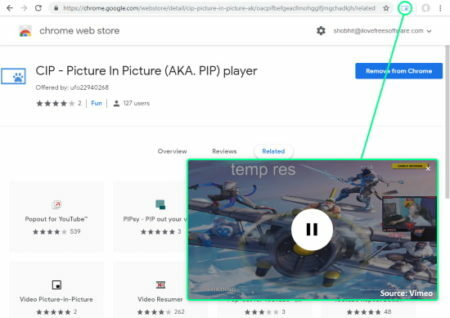 Get CIP – Picture In Picture Player for Chrome here. These are the 5 free Google Chrome extensions that let you use the picture-in-picture mode on Twitch, Vimeo and HTML5 based websites. These extensions give you the freedom of doing other tasks without missing a beat. If you don’t know how to enable flags, you can read more on that here.